Say goodbye to summer and hello to autumn the Catalan way by attending Barcelona´s biggest street party – La Fiesta de la Mercè. In honour of the patron saint of Barcelona, the festival has over 500 events making it the largest and one of the most significant in Catalonian culture. This year the Fiesta begins on Thursday September 22nd and ends on Sunday September 25th with the most popular events including parades, concerts and human towers (see below for this year´s highlights). Most of the events are free and there will be something happening every day of the weekend, so even if you are coming to Barcelona for a short time, you can´t miss this fantastic experience! The Gegants and Capgrossos (giants and big heads) are a great attraction and fun to watch. The tall paper-maché figures are worn by “giant-carriers” and perform dances while those wearing the large heads parade through the streets, often running at the crowds for added entertainment. 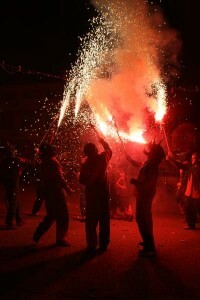 The Correfoc (fire run) is one of the most popular of the events where dragons, devils and other “bestiari de foc”(fire beasts) perform dances and parades with fire. There are usually around 80,000 fireworks used in the correfoc so it can be quite loud but there is also a ´little devils´ fire run especially for children which begins at 18:30 on Sunday and travels along Via Laietana. The Castellers are exciting to watch as they build themselves into human towers, climbing up one another, often with one of the children in the group crossing the top of the tower for a gripping finale. 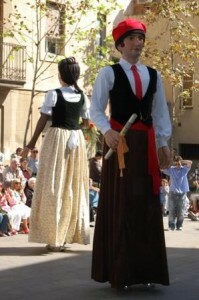 Dating back to the 18th century, the tradition originally comes from Tarragona, just outside Barcelona. 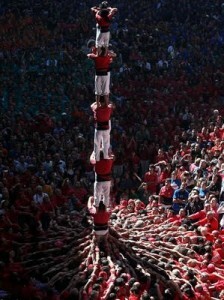 The top teams of Castellers will come from all over Catalonia to perform at La Mercè. Concerts BAM (Barcelona Acció Musical) are a variety of concerts by international music groups especially organized for La Mercè. With more than 60 concerts over a 3 day period and 8 different stages set up around Barcelona such as La Plaça Reial, Parc del Forum and La Plaça del Rei, they are the musical highlight of the festival. For more information on La Fiesta de La Mercè and for a full programme of events go to http://www.bcn.cat/merce/en/index.shtml. Interested in going to Barcelona for La Fiesta de La Mercè? Apartment Barcelona has over 500 fully equipped apartments to rent for short and long term stays. With Las Ramblas apartments, Sagrada Familia apartments and many special offers on Barcelona apartments, you will find your perfect accommodation to enjoy La Mercè´s festivities. This entry was posted in Activities, Events, Places, Travel & Vacations and tagged Barcelona accommodation, barcelona apartments, Barcelona culture, Barcelona festival, Correfoc, Gegants, La Merce. Bookmark the permalink.